The Samsung 840 EVO Series mSATA SSD offers ideal performance for today's ultra-thin laptops and desktops. The 840 EVO mSATA brings blazing speed and 1TB of storage space to machines equipped with an mSATA slot. 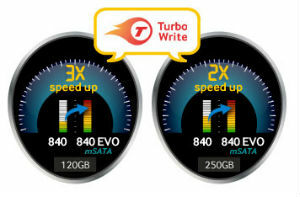 The Samsung 840 EVO mSATA SSD has faster write speeds than previous-generation SSDs thanks to TurboWrite, an innovative write acceleration algorithm. A high-performance write buffer created in the SSD allows for significantly increased sequential write speeds reaching 520MBps. RAPID (Real-time Accelerated Processing of I/O Data) Mode enhances disk performance by processing data on a system level utilizing free DRAM memory as a high-speed cache. RAPID Mode dynamically analyzes application usage and accelerates frequently used data to optimize system performance and eliminate bottlenecks. A faster controller and improved firmware allow the 840 EVO mSATA to deliver higher random read performance. This translates to faster speeds for everyday use--snappier startup, shutdown, application loading, and more. 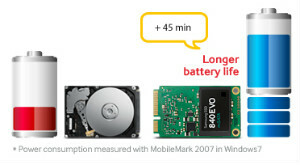 The 840 EVO mSATA draws less power than previous-generation SSDs so your battery lasts longer and the drive stays cooler. The latest generation NAND memory and Samsung MEX controller make the mSATA SSD remarkably efficient, with idle power consumption below 2mW when the drive is in optimized device sleep mode. 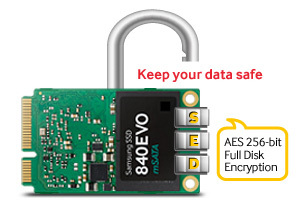 The mSATA SSD's Self-Encrypting Drive technology safeguards your data, and hardware-based AES 256-bit encryption means you don't have to sacrifice performance for protection. Samsung's 840 EVO Series mSATA SSDs come with Samsung Magician software, which allows you to set up and maintain your SSD, enable RAPID Mode and adjust your security settings. Data Migration software simplifies the upgrade process, and a custom cloning option helps you avoid a separate backup process when the target disk is smaller than your original drive. Samsung's 840 EVO mSATA SSD is shockproof, vibration proof, and made entirely of genuine Samsung components. 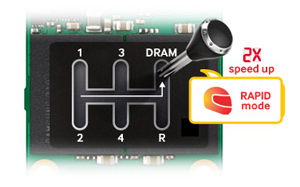 Dynamic Thermal Guard protection ensures optimal operating temperature. 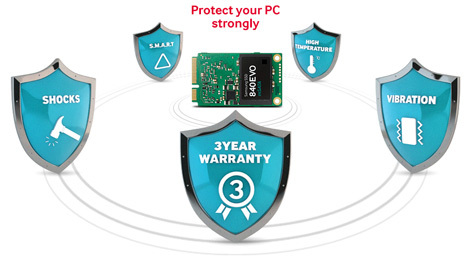 The drive is backed by Samsung's 3-year limited warranty. Samsung 840 EVO Series 1TB mSATA Internal SSD, Samsung Data Migration software, and Samsung Magician software.